The new SR30 secondary standard pyranometer is truly next level! Hukseflux will give a preview of the sensor at the Meteorological Technology World Expo 2016 in Madrid, booth 5085. 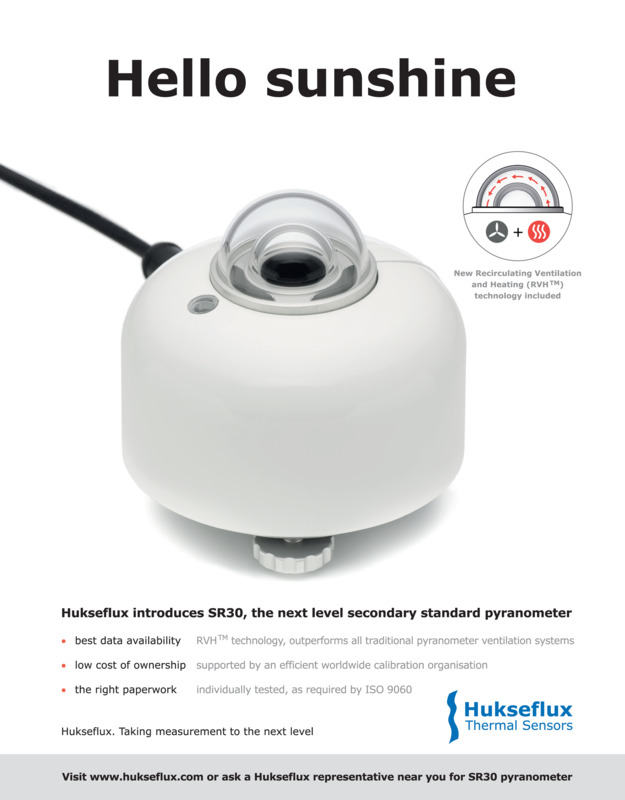 Attendees of Solar Power International 2016, Las Vegas, can preview the feature packed SR30 at Hukseflux booth 642. Hukseflux keeps on growing! We currently have 2 new exciting job offers for employment at our office in Delft, the Netherlands, valid until May 9th, 2016. Both vacancies can be found here (in Dutch): Product Development Scientist and Product Development Engineer. - pricing: ISO second class pyranometers finally affordable for large networks. Hukseflux develops and grows! We currently have 4 new job offers for employment at our office in Delft, the Netherlands. The job offers are valid until December 1st, 2015. An overview of the vacancies can be found here (in Dutch). The new SR20-D2 and SR22 pyranometer are here! SR20-D2 is an upgrade of the successful SR20-D1 secondary standard pyranometer. SR20-D2 is made for the solar PV industry, offering two types of commonly used irradiance outputs: digital via Modbus RTU over RS-485 and analogue 4-20 mA (current loop). The new SR22 has high-quality quartz domes, resulting in an extended spectral range covering the full solar spectrum. The new SR25 pyranometer takes solar radiation measurement to the next level! Using a sapphire outer dome, it has negligble zero offsets. When heating SR25, data availability and measurement accuracy are higher than when ventilating traditional pyranometers. Our secondary standard top model is available with analogue and digital output. See also The making of SR25. Hukseflux is ISO 9001:2008 certified and has a worldwide support organisation to offer you local support and calibration services. New are the Hukseflux representations in India and Brazil! Please choose the "select your region" tab to visit the website of our local offices. Get to know SR20-D1. It is the most accurate digital secondary standard pyranometer available. SR20-D1 outputs irradiance digitally and uses the industry standard Modbus communication protocol over RS-485, ideally suited for the solar PV industry. Interested why pyranometers are the standard for outdoor PV system performance monitoring? Our new white paper explains the advantages of a pyranometer over reference cells. Hukseflux introduces the high-quality VU01 ventilation unit. It is designed for use with the successful SR20 pyranometer and IR20 pyrgeometer. VU01 ventilation unit has the smallest footprint and enables users in need of a ventilated instrument to attain the highest measurement accuracy, even in extreme climates.